It is not often that the US edition of Vogue shines light on a K-pop star, but when the esteemed fashion magazine decided to do so, it came as no surprise that it went with V from BTS. This type of international K-pop group success is not common and is often due to a huge dedicated fanbase; in 2017 and 2018 the group took home the Billboard Top Social Artist Award, fighting off competition from American celebrities like Justin Bieber and Demi Lovato, making it the first K-pop group to be nominated for and win a Billboard Music Award. However, the group’s historic accomplishment was nearly overshadowed by the attention they received for their stylish fashion choices. Receiving praise from Vogue is any fashion-centric person’s dream, yet is hard to come by. Though it has been a while since the magazine expressed these fashion affirmations, V has undoubtedly kept up his Vogue-approved style off the red-carpet even today as is evident below. This is no look that can be worn by just anybody. 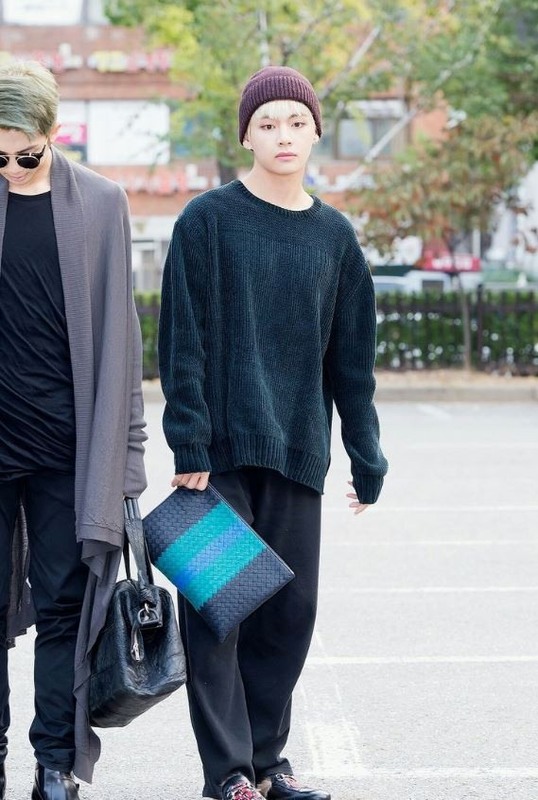 Baggy, sweatpants-like bottoms are partially covered by an oversized knit sweater; they are both derived from dark palettes. His brown beanie is the most form-fitting article of clothing, while his blue-hued, color blocked clutch and red laces detailing fur slides offer the only touch of color to the entire outfit. The silhouette that the clothes create itself can be questionable, but the addition of random color pops is the definition of a risky fashion choice. Yet for V, it just seems like another bold look he pulled off with ease. As noted by Vogue, V hardly ever shies away from the difficult task of mixing prints and colors: such risky choices often enable him to look effortlessly cool, which is the case here. 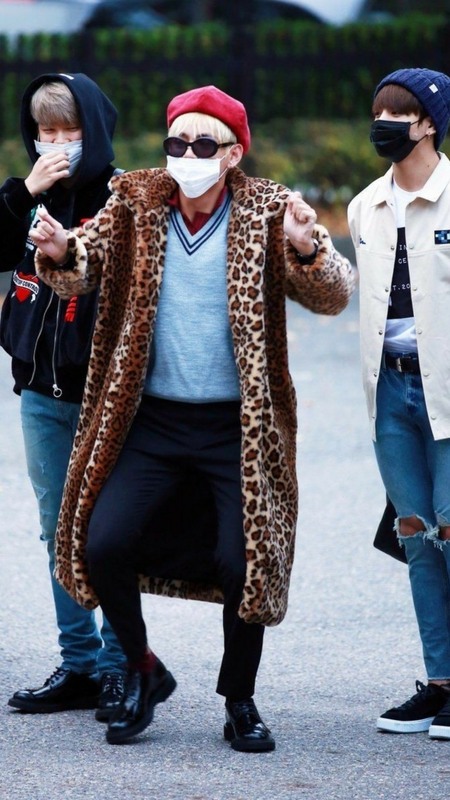 His leopard print trench coat is accessorized with a firetruck red beret, dark oval-style sunglasses, and polished, black lace-up dress shoes. His look is completed with a maroon colored button-up peeking out of a gray pullover with stripes outlining the V-Neck. It is, again, an outfit that surprisingly looks put together on V, but one that not many people would think of creating. From baggy fits to mixing prints, V can make a diverse variety of outfit pairings look fit for a pop sensation, a skill that Vogue has caught on to. The bold spirit of V’s style enables him to pull off any creative fashion creation with ease, which is why the magazine has identified him as the most fashionable. As for the future, with the boy group’s predicted trajectory, BTS fashion will be more in the limelight than ever before.